Every aspect of this suit is designed for high performance without sacrificing comfort. Since its introduction in 2006 the Reaction has helped more athletes accomplish their goals than any other wetsuit. Premium 39 cell Yamamoto rubber achieves superior buoyancy throughout the entire suit. Proven RST panels paired with oversized high stretch arm gussets allow unrestricted reach in the water, while the finest Japanese sourced neoprene delivers enhanced flexibility and buoyancy. Slippery SCS coating reduces drag. Our low neckline and VO2 chest panel create a suit that optimizes energy and swims as fast as it looks. Fleet Feet Sports Madison proudly carries blueseventy wetsuits - both for sale and for rental. The blueseventy line of wetsuits are designed for open water swimming and offer superior fit, buoyancy, and flexibility; which equals more confidence and speed in the water. Please note there are a few changes to the range of wetsuits and great changes to the overall design each year. For more details please read below. Don't forget about personal rewards! You will receive reward points toward your personal rewards account for the purchase of a wetsuit. Are you planning on doing a triathlon this year? Do you need a wetsuit for those cold days of training, but are not sure you want to buy one? Fleet Feet Sports Madison has limited rentals available for you. Please call before coming in, so we can guarantee we have a wetsuit for you to try on. We always recommend trying them on first to ensure you have the proper FIT. If you are renting a suit for a specific event, we encourage you to reserve it early - before your size is spoken for! The wetsuits available for rental are the Blueseventy Reaction full-sleeve for $45, and select sizing of the reaction sleeveless (long john) for $40 per week. $25 of the $40 or $45 rental fee may be applied to a purchase of a wetsuit within the same season. Only one $25 credit will be applied, even if a suit is rented more than once. $10, non-refundable deposit at the time of wetsuit reservation, with the remainder paid at the time of pick up. We have a limited supply of wetsuits available, so we highly recommend trying one on prior to renting, and reserving a suit in advance to ensure availability for your event. Please note: We will not have a rental fleet at Fleet Feet Sun Prairie this year. All wetsuits will be at Fleet Feet Madison only. All pick-ups and drop offs will be at the Madison location on Old Sauk Road only. The blueseventy line of wetsuits consist of both men's and women's sizes. The following size chart will help to provide a good starting point for the size of your blueseventy wetsuit for purchase or rent. The blueseventy line of wetsuits consist of both men's and women's sizes. The women's specific sizing is called Femme Fit and is designed to provide a better range of fit for women of all shapes and sizes. 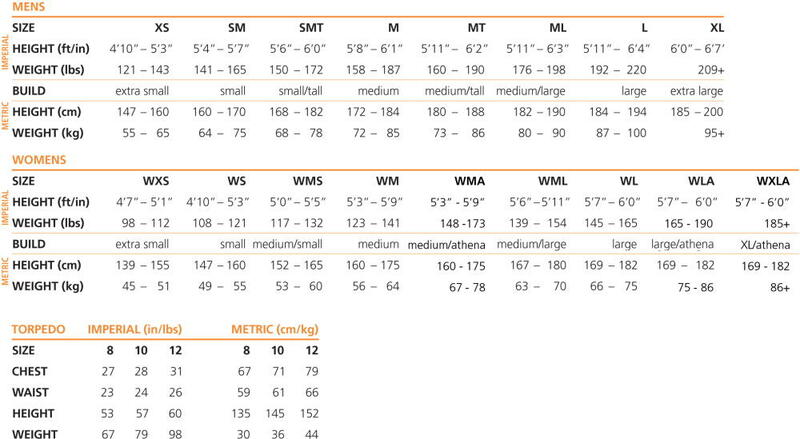 The following size chart will help to provide a good starting point for the size of your blueseventy wetsuit. Keep your blueseventy wetsuit in top condition with Profile Design's wetsuit care products, sold at Fleet Feet Sports.